The addresses for the two Galt House towers are the West, 140 N. Fourth Avenue, and the East Tower, 141 N. Fourth Avenue. The phone number for both towers is (502) 589-5200. The Galt House is bordered on the north by River Road and on the south by Main Street. Fourth Street runs north and south between the two towers. These are referred to as the Galt House and the Galt House East Tower. The East includes suites equipped with a living-room area, refrigerator, and wet bar. The two facilities are connected by both an outdoor pedestrian walkway between the two front doors, and above it a fully enclosed bridge on the third floor. The East Tower has eighteen floors, sixteen of which contain sleeping rooms, and the West Tower has twenty-five floors. The lower room numbers are in the West Tower. They range from 1 to 35, preceded by the floor number. On the east they range from 46 to 98, preceded by the floor number. For example, room 1201 is found on the West. On the East side the twelfth floor numbers begin with 1246. When you enter the Galt House West Hotel, you are facing west. Walk straight west, and the front desk will be to your left, along the south wall. If you stand at the registration desk in the West Tower, the bank of four elevators will be directly behind you on the north wall. The staircase leading to the second floor of the West Tower is to the left (south) when you enter the front door, before you reach the check-in desk. The Galt House East Tower. The front door of the Galt House East Tower faces west. As you enter, you are facing east. If you turn left (north) just inside the door, you pass through a small lounge area with chairs and low tables. This is the entrance to the Lobby Bar, which is located between the back of the elevator bank and the west wall of the building. To find the desk once inside the door, walk straight ahead for a few feet, then turn left, and walk several yards. You are facing north, and the hotel registration desk is to your right, along the east wall. The elevators are to your left, along the west wall. The stairs leading to the second floor are directly in front of you, on the north wall. In the West Tower the layouts of the second and third floors are quite similar. As you exit the elevators, you enter a large open area and are facing south. The main hallway is to your left. Also to your left is a large support pillar, just waiting to embarrass you. There is about a ten-foot space between the elevator wall and the pillar. Turn left and follow the wall until you hear the hallway opening to either side. If the area in front of the elevators is congested, you should swing wide to pass the pillar on the south rather than the north. The River Grill, located on the second floor of the West Tower, is at the northwest end of the building. Exit the elevator and turn left to reach the hallway, then turn left again and follow the hall north. The River Grill is at the end of the hall on the left and has moderate prices. The Flagship is a first-class revolving restaurant with prices to match. It is on the twenty-fifth floor of the West Tower. The outdoor pool is located on the third floor, west side. The Galt House gift shop and barber and beauty shops are on the second floor west. Exit the elevator, turn left, then right (south) along the main north-south hallway. D'Marie Lounge is on the twenty-fifth floor of the West Tower. It features 120 brands of Kentucky bourbon. 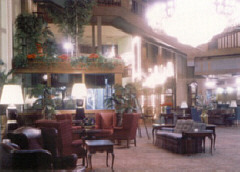 The lobby bar is in the lobby of the East Tower. All rooms have coffee makers, blow dryers, and irons. If you drive, you should remember that the Galt House charges a $5-a-day parking fee. To reach the third-floor enclosed bridge from the West Tower, turn left out of the elevator to get to the main hallway. Turn right and walk south down the hall. Turn left at the first opening (east), and turn left again (north). After a while you will hear some noisy air conditioning equipment. Walk a bit farther until you can turn right (east). You are now on the enclosed bridge--windows on your left, wall to the right, echoes. After you leave the bridge, jog a bit to the left to avoid running into a banister like those found on stairs. You will find a wall to the left and open space to the right. Keep walking south. You will soon find a wall on the right. Then the hallway will open up to the south again. Turn right (south). The elevators of the east tower will be to the right. To reach the West Tower from the East Tower, exit the elevator on the third floor and turn left. Turn left again almost immediately; you are now facing west. Keep walking west and jog to the left to enter the bridge--windows to the right, wall to the left, echoes. Continue west until you hear the air conditioner and the ambience changes. Turn left (south) and then right (west) and then right (north) again. You are now in the main north/south hallway of the West Tower. The openness to your left is the area where the elevators are. Pass the pillar, turn left, and the elevators are immediately on your right. Here is the Hyatt's general information: Phone number, (502) 587-3434. The address is 320 West Jefferson. If you arrive by taxi at the Hyatt, you will turn into the hotel driveway from West Jefferson, which runs east/west. The entrance faces east, and you will enter a short hallway going west. At the end of the hall you will enter what can best be described as a circular lobby. Make a right, continuing your path counter-clockwise around the circle. You will find a bank of telephones on your right and the elevators on your left. They and the escalators stand in the central area of the lobby, which includes a central atrium that the upper floors look into. In the lobby the front desk is just past the phones on your right, across from the elevator doors. If you enter the hotel by the Fourth-Avenue door, you are walking east and will step immediately into the circular lobby. If you walk straight ahead from this door, you will step onto the escalator to the second floor. Just a few feet inside the door and to your left is the Trellis Caf�, a full-service restaurant featuring American cuisine and open for breakfast, lunch, and dinner. Pepper's Bar is located at the Fourth Avenue end of the building on the second floor, directly above the Trellis. At the top of the escalator turn left. When you reach the bank of elevators, turn left again, and Pepper's is there. On the first floor, continuing clockwise around the circular lobby, past the Trellis, you will reach the front desk. When you face the front desk, the elevators will be directly behind you. When standing at the front desk, you can turn right, continuing clockwise around the circle to find the hotel gift shop. It is just after the bank of phones and the hallway from the West Jefferson entrance. There is nothing unusual about the numbering system in the Hyatt. The sleeping rooms are on floors three through eighteen, beginning with room 301, the lowest, and 1828, the highest. The Hyatt rooms are equipped with blow dryers, irons, and coffee makers. Parking is $7 a day at the Hyatt.